Could life exist on Barnard b, one of the nearest planets to our sun at only 6 light-years away but its host star is dim making it a very cold planet. Here’s more exciting work regarding the newly discovered super-Earth exoplanet orbiting the legendary Barnard’s Star. This star is the closest single star (and now the second-closest star system) to our own sun at only six light-years away. 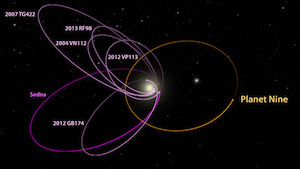 Astronomers announced its new-found planet – labeled Barnard b (or GJ 699 b) – as recently as November 2018. Last week (January 10, 2019) – at the 233rd meeting of the American Astronomical Society (AAS) in Seattle, Washington – astronomers from Villanova University explained their new work showing that – although this world is likely cold (-170 degrees Celsius or -254 Fahrenheit) – it could still have the potential to harbor primitive life. Here’s the thing about Barnard’s Star b, whose mass is just over three times that of Earth. It orbits Barnard’s Star – a dim red dwarf – every 233 days, at roughly the same distance that Mercury orbits our sun. 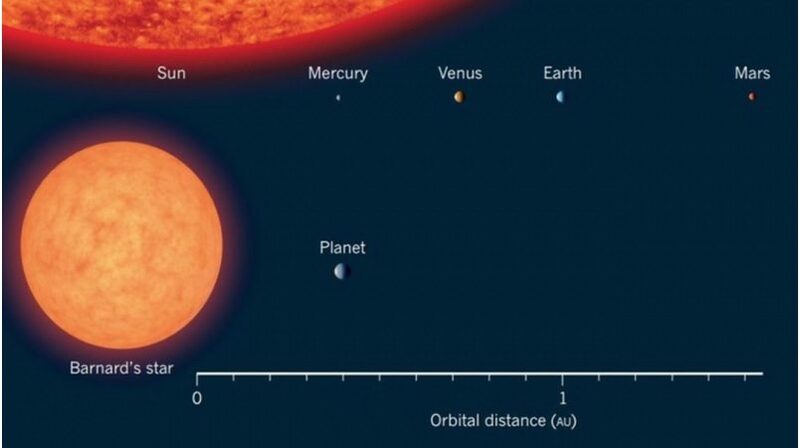 In the Barnard’s Star system, though, this distance is near the star’s snow line, that is, the point where heat from Barnard’s star needed to keep water molecules as vapor ends. Past the snow line, water can become ice. In order for Barnard b to have some form of life, these astronomers said, the planet needs another heat source. They suggested a large, hot iron/nickel core – much as Earth has – and enhanced geothermal activity. Geothermal heating could support ‘life zones’ under its surface, akin to subsurface lakes found in Antarctica. We note that the surface temperature on Jupiter’s icy moon Europa is similar to Barnard b but, because of tidal heating, Europa probably has liquid oceans under its icy surface. 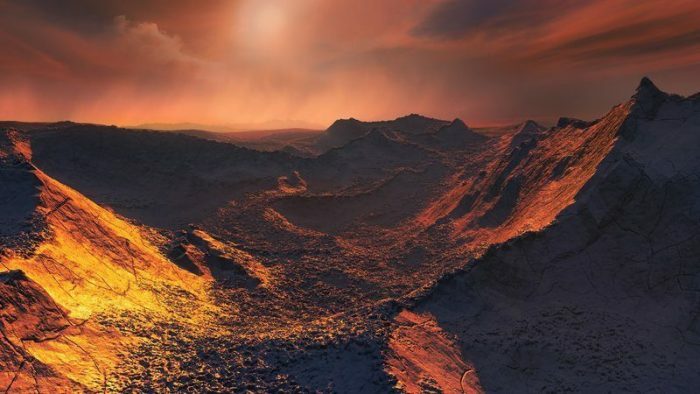 Artist’s concept of the surface of the newly discovered planet called Barnard’s Star b. Its sun is dim and red. Could life exist under the surface of this cold world, heated from below? Image via ESO/M. Kornmesser. Guinan and Engle have been studying Barnard’s Star for a long time and were part of the discovery team that found the new planet. They’ve obtained high-precision photometry – that is, light measurements – of Barnard’s Star (as well as dozens of other stars) for the past 15 years. Such observations will shed light on the nature of the planet’s atmosphere, surface, and potential habitability. The most significant aspect of the discovery of Barnard’s star b is that the two nearest star systems to the sun are now known to host planets. This supports previous studies based on Kepler mission data, inferring that planets can be very common throughout the galaxy, even numbering in the tens of billions. Also, Barnard’s Star is about twice as old as the sun — about 9 billion years old compared to 4.6 billion years for the sun. The universe has been producing Earth-size planets far longer than we, or even the sun itself, have existed. 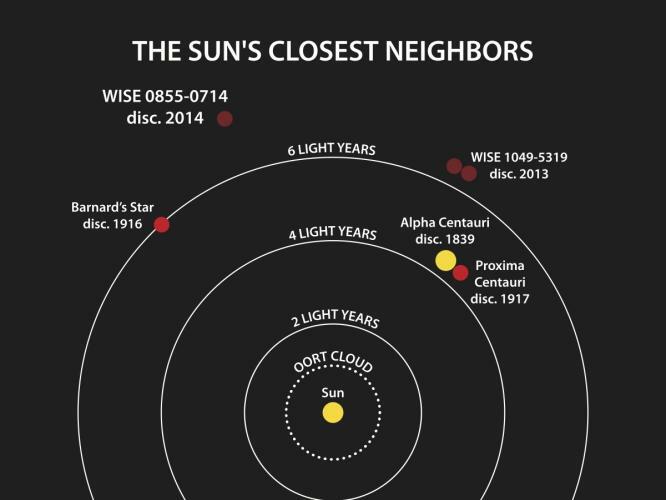 Our sun’s closest neighbors among the stars, including Barnard’s Star. Image via NASA PhotoJournal. Bottom line: A new study shows that the nearby exoplanet Barnard b (or GJ 699 b) might host primitive life if it has a heat source other than its dim sun, such as a large, hot iron/nickel core – much as Earth has – and enhanced geothermal activity.